Allgaier drum dryers or rotary kiln dryers come in single, double and triple-shell designs. Our dryers process materials with very differing granulometric properties, or highly fluctuating moisture levels at a high throughput rate. Drying and cooling can be achieved in one machine with our multi-shelled dryers. 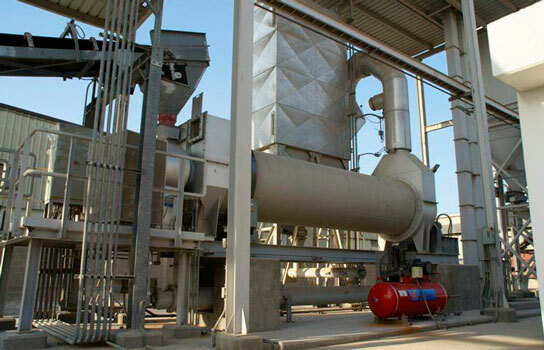 Drum dryers with integrated cooling consist of double- or triple-shell structures. The drying process takes place in the inside tube. The dried and still warm material then passes through the outer tube where it is cooled using cold ambient air. 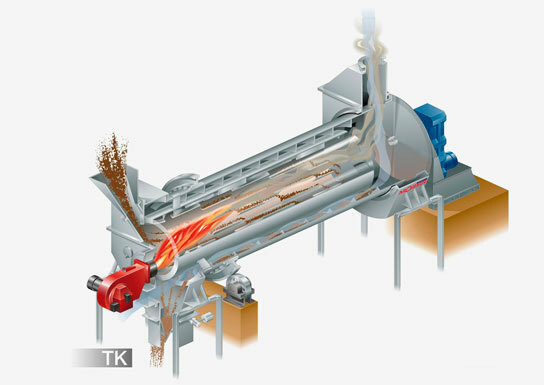 Indirectly heated rotary kiln dryers are used for temperature control and calcination at temperatures up to 600 °C. 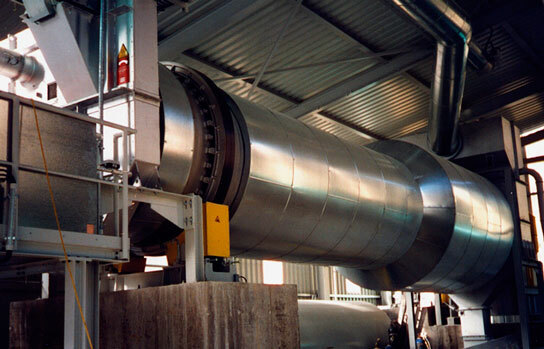 This style of drum dryer is especially effective at recovering heat energy when used for cooling very hot solids from calcination drums and rotary kilns. Allgaier drum dryers are also capable of simultaneous product cleaning. These types of drums have an area in the inside of the dryer in which the solid material is rubbed against itself to an increasing extent. Adhering dirt is removed by the coarse material and can be blown out with the dryer exhaust air. We also have specialized drum dryers that deagglomerate, dry and separate bulk materials, or shred filter cakes or sludges for more efficient drying. Contact our solutions experts for help determining the best drying and cooling equipment for your specific application. 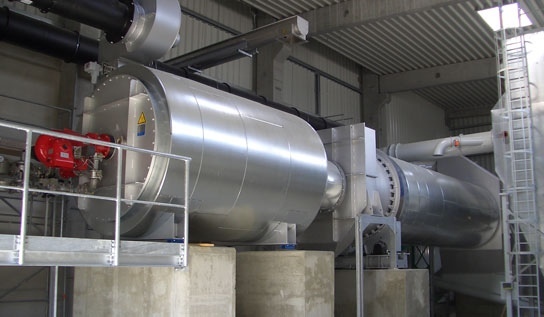 Fluidized-bed dryers and coolers are suitable for a wide range liquid and solid material processing applications in which the production parameters remain predominantly constant. Our fluidized bed dryers direct a heated air flow up through a bed containing the material solids. This heated air causes the solids to be fluidized creating optimum drying, reaction and handling conditions. Allgaier fluidized-bed dryers can operate as continuous dryers or batch dryers. Allgaier’s fluidized-bed dryers are used in the chemicals industry, pigment manufacture, foodstuffs, and pharmaceuticals industries, as well as the construction materials, mineral and ceramic industries, fertilizer manufacture and in the plastics and recycling operations. Allgaier fluid-bed dryer technology covers the complete material processing flowsheet. Our fluid bed dryers can be combined with our screening machines to make tailored plant solutions. With integrated cooling, Allgaier’s fluidized-bed dryers are particularly suited for high solid and water vapor performance levels in the salt and soda processing, fodder, foodstuffs, and plastics. A high-quality solid and water vapor performance can be achieved with comparatively low air quantities and relatively low temperatures. Contact us to see how we can supply complete processing equipment solutions for your application. The Allgaier CD Dryer is a contact dryer for recovering dry materials from solids-laden liquids such as solutions and suspensions. Process liquid is fed using a pump and several nozzles onto an assembly of disks heated from the inside by steam. The liquid evaporates from the disks’ surface as they make one rotation. Blades that contact the disks scrape the remaining dry material where it is deposited for transport to a product discharge chute. Vapors are removed with as high water vapor concentration resulting in low thermal energy loss in the dryer exhaust air. In addition to producing dry materials from liquids, solutions can be partially vaporized thereby increasing the concentration of the liquid. The CD Dryer is a robust alternative to upright thin film evaporators. The CD Dryer’s disk design is substantially more compact than comparable contact dryers such as drum dryers. In addition, the transferable thermal power/m² of heated surface is higher than for drum dryers. This results in better energy efficiency in a smaller equipment footprint. Allgaier’s rolling bed dryer combines the advantages of the drum dryer and fluidized-bed dryer systems in drying wood chips and organic residue applications. Our rolling bed dryer technology achieves homogenous and gentle drying at a low temperature due to the duration material in the dryer. Processing organic residues to manufacture alternative fuels requires specific requirements. Allgaier’s rolling bed dryers can work within these production requirements at an efficient operating level. The waste heat from combined heat and power stations used for generating electrical energy can be effectively reused in the roller bed dryer. Allgaier Process Technology also offers specialized dryers for less common applications. These products include spray granulators, suspension and paste dryers, granulation and coating drums, and grain heaters.